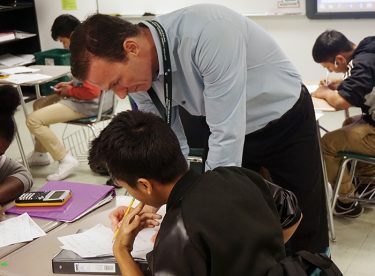 Dr. Jim Mostofo, a professor at GCU, has been able to improve his own practice by revisiting the high school classroom. Twice a week, he co-teaches Algebra 1-2 with Mayra Diaz at Alhambra High School. 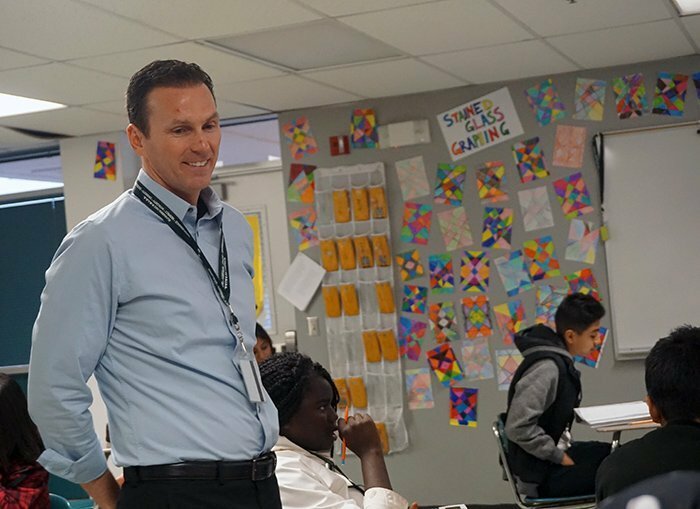 Two teachers have discovered a new way of collaborating with one another, and it all begins by sharing a classroom at Alhambra High School, just blocks away from Grand Canyon University. He turned to a former student, Mayra Diaz, who teaches algebra at Alhambra, and offered to team teach. Diaz is a first-year teacher at Alhambra. Mostofo, who taught algebra in the Tolleson Union High School District for 16 years, said the experience is a nice balance between teaching at GCU and being at Alhambra. 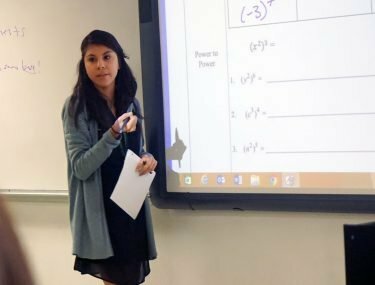 Diaz, who attended Fairfax High School, in the same district as Alhambra, and did her teaching practicum at Alhambra, said the local perimeters have positively affected her outlook on teaching. The 23-year-old was hired full-time one year ago. “I now have kids in my classroom that I student-taught to, so that’s kind of interesting because they are comfortable and they’re very friendly — I’m not entirely ‘new’ to them,” Diaz said. The 29 students in her classroom benefit from the co-planning, co-teaching and co-assessing that goes on between the instructors. In addition, this initiative has allowed for Mostofo to improve his own practice and become more familiar with current curriculum and teaching practices. That, in turn, helps him improve his teaching methods in the College of Education’s teacher preparation program. Diaz admires Mostofo’s teamwork and effectiveness in the classroom. However, she admits that getting used to each other was no easy task. “Think of it like having your boss coming in to watch you all the time. It is a little nerve-racking because you want to make sure that you are doing everything right — they did, after all, teach you,” Diaz said. Mostofo and Diaz both said they had to overcome some initial hurdles to mesh their teaching styles, but through communication they have built trust. Mostofo walks around Diaz’s classroom while she teaches a lesson. Now, they sometimes sound like a married couple who finish each other’s sentences and pick on one another. During one lesson, Mostofo uses the phrase, “When in doubt, write it out,” to help students remember how to solve several problems. “I like rhymes,” he tells the students. Diaz and Mostofo usually do whole class lessons, but sometimes one or the other will lead a smaller group. With two teachers in the classroom, every student in the classroom gets individualized attention, Diaz said. Often, she added, a student might not connect with her but might feel more comfortable with Mostofo. Great teamwork. Thanks for sharing your experiences.